The beauty of the mikado gives form to the femininity of the princess lines and the V-neckline. A classic design that features an A-line cut with lace and thread-embroidered appliqués on the train and bodice. 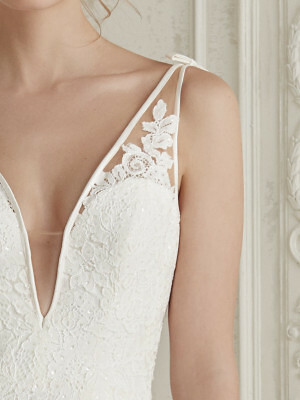 The V-necklines have a bias-cut tulle trim and beading that play with the sheer effects of the illusion tulle and the tattoo effect to outline them against the skin. Shown in Off White/Crystal. Available in Off White/Crystal or Off White.